(TibetanReview.net, Apr07, 2016) – The man who once ran the world’s largest army, the People’s Liberation Army (PLA) of China, has just been charged with taking bribes totalling 80 million yuan, reported the South China Morning Post (Hong Kong) Apr 6. Guo Boxiong, the retired military chief of the People’s Liberation Army, had been under investigation for corruption since last year and was expelled from the Communist Party in July. 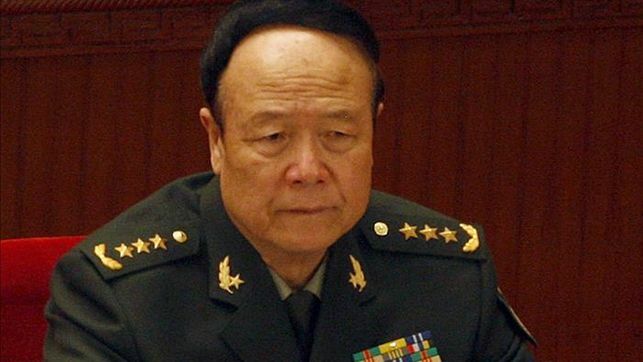 The 74-year-old former vice-chairman of the Central Military Commission (CMC) has become the highest-ranking military official to be charged in President Xi Jinping’s far-reaching corruption crackdown. Military prosecutors were reported to have wrapped up the criminal probe into Guo, with the case now having been filed to a court. The report said that the man who was once a member of the party’s 25-man Politburo is also the highest-ranking general to face a graft charge since the foundating of the People’s Republic of China in 1949. Military prosecutors were reported to have played down the amount of money involved in Guo’s case, since the official number was just a small fraction of the amount Guo actually received. This takes note of the fact that recent trials of top officials on graft charges had often involved bribes paid to the family members or close aides of the officials, rather than directly to the officials themselves. The report said the party began investigating Guo last April. The probe was made public three months later when he was sacked from the party and handed to prosecutors from the PLA’s disciplinary watchdog. Guo was the most powerful professional soldier through both of former president Hu Jintao’s terms. He was the powerful CMC’s first-ranking deputy and in charge of the day-to-day operations of the world’s largest army for a decade. The report said Guo’s case was likely to be heard in a closed-door military court. It noted that associates of Guo had also been investigated for corruption in the past two years, including his son Guo Zhenggang and long-time subordinate Fan Changmi.